Butterfly is the most beautiful swimming, but it can be painful if you don’t swim it according to your flexibility, abilities and age. You probably heard that Butterfly is not healthy or even worse that it’s going to heart and cause pain to your lower back and shoulders?? So You are right and wrong, you will cause pain if you swim like Olympian swimmers, no you won’t cause pain if you swim in the WEST swimming technique which was developed in order to loosen your body and protect neck and lower back. So what is the difference? And why is WEST swimming technique butterfly the best swimming technique for people above the age of 21? 70% of the people around the world at the age of 21+ suffer from lower back pain, when we swim the “normal” butterfly we create an arch on our body which can lead to stress in our knees, lower back, shoulders and neck, you don’t need to be an expert to understand that throwing your hands above the water while kicking strong with our legs is too painful for your lower back. Isn’t it amazing to loosen and strengthening instead of hearting our body? Goggles, fins, swimming suit, plastic sheet and the workout print out. You can also watch the workout via Udemy application right in you smartphone or tablet. Over 42 lectures and 1 hour of content! 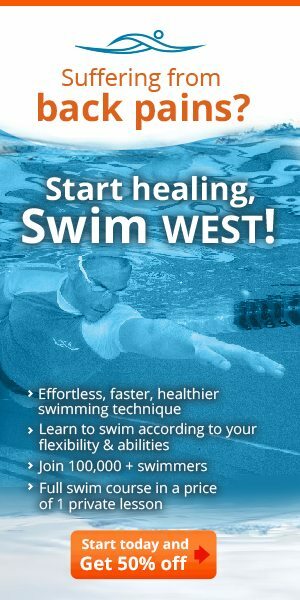 WEST butterfly swimming class is suitable for those who are capable of completing 20 continuous freestyle laps (with no breaks), not suffering from any major neck, shoulder or back pains. If you do, it is strongly recommended to start with a freestyle class and then take the butterfly class. The class is suitable for immature and professional swimmers who swim at least twice a week, on a regular basis. WEST technique works for every age, as long as it is carried out properly, along with performing stretching, following workout instructions and watching every video at least twice.